Just wanted to express my appreciation to you both for your catering assistance on 15th September. As per usual with all of our Ulysses functions, the food you supplied was delicious and I am very grateful to you for your catering expertise with my party. We just want to say thank you so much for the fantastic service and food you provided to us for International Nurses Day. You were an absolute pleasure to deal with the whole way through and very professional. Nothing was a problem and it all felt so easy. The food was fabulous and thoroughly enjoyed by all our staff. Just wanted to thank you once again for another brilliant Xmas Lunch for our Staff! This year we doubled the number in attendance from 40 to 80, and you still made the catering look effortless. The food was (as always) absolutely amazing, and I am just about to send you another email to see if you can cater for next year’s function due to the overwhelming amount of compliments we had about this one. All the very best, talk to you soon! I just wanted to touch base to thank you for the great job you did with the food for our wedding on the 3rd. 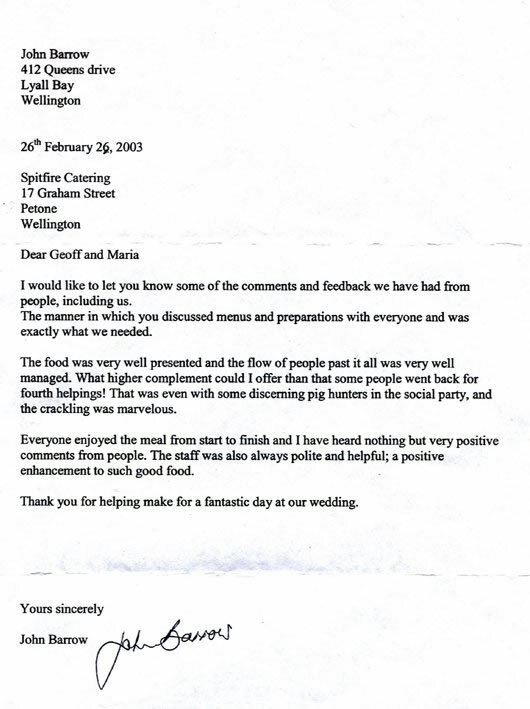 We had some positive feedback from our guests, both regarding the food and your professionalism and friendliness. I just wanted to send you a little note to say what an amazing job you and your lovely team did for our wedding! It was such a pleasure knowing the food was in such capable hands. Everybody LOVED your food especially the beef which people are still talking about and your delicious salads which really catered for everyones tastes. I've attached a couple of pictures for you to see. We really couldn't have asked for anything more, you were perfect! Thanks for a great meal last Thursday, the food was delicious again and the service excellent!! We’ve had nothing but good feedback. Hope you and your team have a great Christmas and best wishes for 2012. Please find attached a letter of thanks from the Hutt Valley Dodgers Dynamos for the fantastic food you provided for our dinner, and your great support of the whole night. Thank you Maria, you did a wonderful job and exceeded our expectations. We will definitely recommend you to others and some of our guests expressed their admiration for the very tasty food. 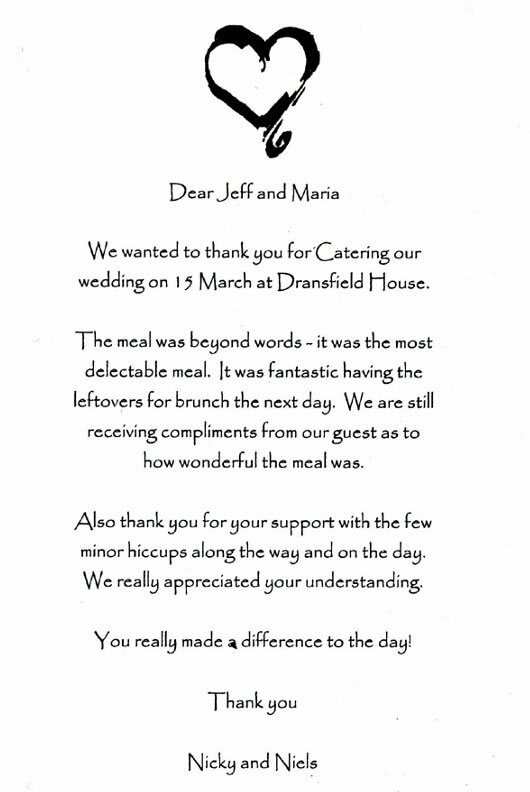 Hello Maria, just a quck note to say thanks for the meal on Saturday. Everybody thoroughly enjoyed it and it was such a treat for me to know our expectations of delicious food, more than enough for all and reliable delivery would be met. The whole celebration has been wonderful and the senior Blacks were overwhelmed. First of all your cost per head was very competitive and saved us a considerable amount of money. You and Jeff travelled over to Carterton to make yourselves familiar with our home so you'd know where everything was before the big day. On the day you arrived at the appointed time, set everything up with as little fuss as possible. The food was served on time and there was plenty of it, it was hot, well presented and well cooked. The main course was just delicious as was the dessert. The leftovers were cleared away discreetly and without disturbing the serious part of the wedding, and left nicely stored in our containers. All the plates, cutlery and serving dishes were spotlessly clean and matched and looked really lovely on the spotless tablecloths. 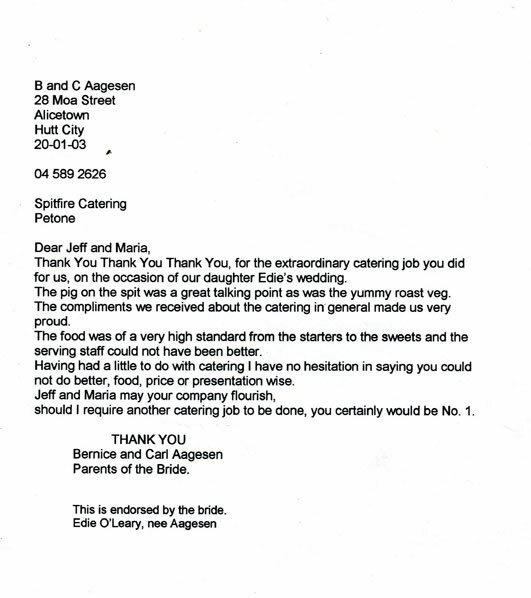 Our guests commented on the great food and service. All in all it was a pleasure using your company and I have absolutely no hesitation in recommending you to anyone who wants an honest, well cooked meal. Many thanks for a lovely meal, great service and great value, with the professional service with the personal touch. I would like to thank you for once again giving us outstanding service and excellent food. The chocolate fountain was fantastic and my personal favourite. For the third year running you have given us superb service and helped us to get a menu that fitted our budget. Thank again and we look forward to dealing with you again in the future. Copyright © 2006-2019 Spitfire Catering Ltd. All Rights Reserved.